[0:00] <oy1r> it was a different version of raspbian tho. [0:07] <niston> what was the problem? [0:42] <Pupeno> Is there a way to re-program or upload data to a Raspberry PI remotely? I want to use it to control some lights but over time I want to improve the patterns and the Raspberry PI is going to be installed in a very inconvenient location. [0:45] <Pupeno> I'm happy with ssh, but it would mean having to use wifi to reach it. [0:46] <Pupeno> niston: wifi would be the only option. This would actually be outside, high on a wall. [0:46] <niston> should be fine, no? [0:47] <Pupeno> Would it be with something like this: http://www.adafruit.com/products/814 ? [0:47] <shiftplusone> What did you have in mind when you said 'remotely'? A network connection seemed to be implied. [0:47] <niston> pupeno you could use this, yeah. [0:47] <Pupeno> I'm sorry. By remotely I mean with me not having physical access to the device because it's outside high up a wall. [0:48] <ijustam> pi comes with mathematica? [0:48] <Pupeno> How stable is it? or rather... does pi come with some sort of watchdog? [0:48] <shiftplusone> ijustam, as far as mathematica is concerned... not very. [0:49] <Pupeno> I'm totally new to Raspberry Pi... but since I have a lot of experience coding on Linux, I think this will be a much more convenient solution that Arduino. Specially if I can upload programs remotely. [0:50] <niston> although when I used the watchdog with a project of mine, I had trouble with the deamon I tried. so I ended up just feeding it from my application. [0:52] <niston> one out of four I had did this. yeah pretty strange. [0:53] <niston> I wonder does USB forwarding work with RDP? [0:54] <Pupeno> Is there a preferred programming language for the Raspeberry Pi? C? [0:54] <Pupeno> Ok... I'm happy with C, Python, whatever. [0:55] <niston> I wrote a password cracker for RDP in 2003. [0:55] <Pupeno> Where should I get started? I don't need to learn to code, I been coding for 20 years. [0:56] <Pupeno> niston: I know Python already. [0:57] <niston> raspbian is popular. [0:58] * plugwash wouldn't call it a "fork"
[1:01] <Pupeno> How do I learn to use the I/O, watchdog, etc? [1:01] <Pupeno> Is there a good book or tutorial for developers? [1:03] <niston> as for a book, I wouldn't know. I mostly use the web, these days. [1:06] <Pupeno> niston: well, I already knew about the existence of watchdogs, how do I learn about things that I don't know that exist? [1:07] <niston> ic. browsing the forum brings up one thing or another, at times. [1:13] <mikroskeem> niston: vga output supports gpu or is it another emulation(like those spi lcd panels)? [1:24] <niston> if you could combine V/H Sync or even add these to Green, you could provide analog RGB for projectors. [1:25] <Pupeno> What do you use to control 220v lamps with a pi? [1:25] <niston> Pupeno: Solid state relay. [1:26] <Pupeno> Something like this: http://www.amazon.com/SainSmart-8-Channel-Duemilanove-MEGA2560-MEGA1280/dp/B006J4G45G ? [1:26] <Pupeno> plugwash: no, I want to make it fliccker. [1:27] <niston> cuz if u wanted to dim with PWM, you'd need an SSR without zero crossing detector, I think. [4:49] <linuxmint> Hi, how can I view my posts? Search and FAQ don't say how? [4:49] <linuxmint> RaspberryPi forum posts that is. [5:18] <zylinx> what is your project in mind ? [5:20] <zylinx> kgrayallday, since you are new to IRC as a whole these "rules of thumb" for IRC might help. don't ask to ask just ask :) and don't always expect immediate responses. [5:21] <zylinx> so you want a monitor and webcam at each end or just one way ? [5:23] <zylinx> are you running debian on the Pi ? [5:29] <linuxmint> Any motion detection software that works on the raspberry pi's camera, like ZoneMinder? [6:01] <linuxmint> Would there be a way to test if a firewall was blocking a Wi-Fi connection from a Raspberry Pi? [8:29] <skyroveRR> Does the pi support 20x4 HD44780 LCD panels or is it limited to 16x1/16x2 panels only? Via GPIO. [8:32] <skyroveRR> Have you tried any? [8:32] <CoJaBo> I'm trying to get a VFD to work..
[8:51] <gordonDrogon> skyroveRR, there are many libraries that support the panels. [8:52] <skyroveRR> Ok, just for knowing, have you tried one? [8:53] <gordonDrogon> and https://projects.drogon.net/raspberry-pi/wiringpi/lcd-library/ has a 20x4 running. [8:54] <skyroveRR> Erm.. btw, what's the difference between 4 bit mode and 8 bit mode? [8:54] <skyroveRR> No, I mean..
[8:54] <gordonDrogon> 8 bit mode needs 8 pins/wires for the data, 4 bit mode only needs 4, but you need 2 cycles to transfer the data. [8:54] <skyroveRR> So... which one is better? [8:55] <skyroveRR> And which program is it using? I mean.. lcd4linux or lcdproc... which one? [8:56] <gordonDrogon> its not using either - I wrote a library designed to be used by C programs. [8:56] <skyroveRR> But it can show system stats easily with lcd4linux, right? Since that program is in raspbian's repos AFAIK. [8:57] <gordonDrogon> I've really no idea. [8:57] <gordonDrogon> it would probably be easy to change lcd4linux to use my library directly on a Pi, but it's not something I've ever looked at. [8:59] <skyroveRR> Do you attach a dupont connector to the GPIO pin? [9:00] <gordonDrogon> no idea what that is. [9:00] <CoJaBo> gordonDrogon: is there any existing lib for a vfd? [9:00] <skyroveRR> How do you attach the wires to the GPIO? [9:00] <gordonDrogon> dupont ia chemicals maker as far as I'm aware..
[9:00] <gordonDrogon> CoJaBo, I've seen a VFD with the usual hitachi chip on it..
[9:00] <gordonDrogon> skyroveRR, with wires - look at the pictures on those links I gave..
[9:01] <skyroveRR> gordonDrogon: what are those wires called? [9:01] <skyroveRR> I mean the connectors on them? [9:03] <gordonDrogon> skyroveRR, oh - they're just generic 0.1mm connectors - Dupont is just another company making them - maybe they made them first, who knows. 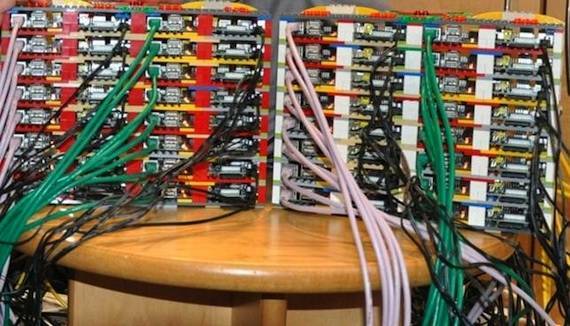 we call them jumper wires and get them ready made. [9:03] <gordonDrogon> *0.1 inch. not mm! [9:03] <gordonDrogon> CoJaBo, can't find a proper data sheet for it - but it looks like an SPI interface. [9:04] <skyroveRR> It's a pain to find those jumper wires here. [9:04] <gordonDrogon> just a company name used for a connector - like "molex", etc. [9:04] <gordonDrogon> CoJaBo, clock, data, enable? [9:04] <gordonDrogon> CoJaBo, that's all you need for SPI output. [9:04] <skyroveRR> gordonDrogon: BTW, did you solder the jumper wires directly on the LCD? 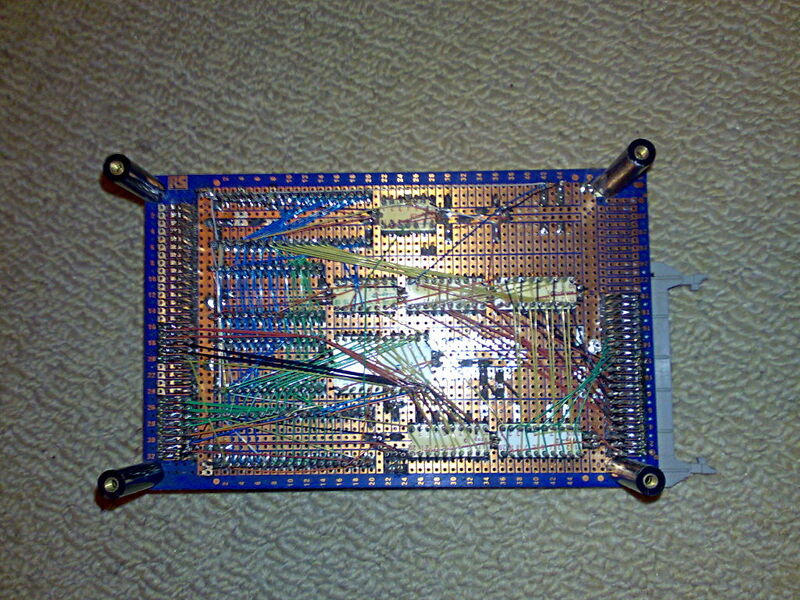 [9:05] <gordonDrogon> skyroveRR, no - I soldered 0.1" pins to it then plugged it into a breadboard - please look at the photos. [9:05] <skyroveRR> Uh that's what I meant... sorry for not being clear. [9:05] <CoJaBo> It describes it only as "serial"
[9:07] <skyroveRR> gordonDrogon: which is that black round thing on the breadboard? [9:08] <skyroveRR> https://projects.drogon.net/wp-content/uploads/2012/07/lcd4_bb.png <- the one with 3 inputs? [9:08] <CoJaBo> dunno what it's even called..
[9:09] <gordonDrogon> skyroveRR, it's a potentiometer. gives a variable output voltage. it's used to adjust the contrast. [9:09] <skyroveRR> gordonDrogon: what's it's value? [9:11] <gordonDrogon> it's all pretty standard off the shelf stuff here - but you said stuff was not easy to get where you are? where's that? [9:12] <gordonDrogon> thought it was reasonably ok getting stuff there. [9:12] <skyroveRR> I do have the potentiometer, though. Just not the jumper wires. Can't find them in the market. [9:12] <RahulAN> I need to control tv by my Pi, How to get what to send to TV to change channel? [9:14] <winlu> cec or ir? [9:19] <jacekowski> what sort of IR transmitter have you got? [9:21] <RahulAN> yes i want like that..
[9:23] <RahulAN> so what i need? [9:27] <a7x> is there a good RTOS for rpi? [10:08] <Gyrth> I'm trying to turn terminal output to colored php text. But all I can find is examples of turning PHP text to colored terminal output. [10:13] <Gyrth> For example I get "[01;34mscripts[0m" back. It should return �scripts� in blue text. [10:14] <Gyrth> Would it work with a strpos?? [10:18] <Gyrth> Ah my keyboard doesn want to do quotes anymore. [10:35] <Gyrth> winlu, http://pastebin.com/dYcatNMZ How do I get PHP to treat color:yellow as a string? [10:36] <winlu> ' and "
[10:40] <RahulAN> jacekowski, means i have to use remote every time? [10:42] <Gyrth> winlu, yeej It works! I keep forgetting to put $string = in front of the str_replace. For some reason I assume it writes to $string automatically. [10:43] <Gyrth> winlu, oh I don't. [10:43] <Gyrth> But that never stopped me. [11:31] <Gyrth> winlu, ha! to prove my point. I put a ) in the wrong place and that made any password valid. [11:32] <Gyrth> You could litterly smash your face onto the keyboard and you be logged in as a developer. [12:24] <Pkunk> Is there an issue with clock_gettime on 3.12.y kernels ? Its returning completely bogus values for me ..
[12:26] <Bhaal> Have there been any reports of sun damage to the pi camera sensor? [12:32] <didlix> Is it at all worth doing fun things with LEDs and buzzers with Pi, or should I just learn Arduino? [12:33] <gordonDrogon> didlix, it's fun. do it on a Pi. [12:33] <gordonDrogon> much easier too. [13:32] <Gyrth> When using a div to show text. How do you set the scroll to the end of the div? [13:44] <Gyrth> winlu, hoe laat ik het div venster op de laatste regel focussen? [13:46] <Gyrth> pksato, I got that. But now it needs to be scrolled down by default. [13:51] <Gyrth> Ah! I got it. [14:18] <neutrino--> yes Gyrth ? [14:19] <Gyrth> neutrino--, just saying hi. We were having a hello party. [14:20] <neutrino--> hello then ! [14:21] <Gyrth> They're ignoring me in the php channel. [14:23] <Gyrth> lost_soul, but it hurts. [14:24] <lost_soul> Gyrth: what doesn't kill us makes us stronger.. or some crap like that, right? [14:29] <Tinkerton> So, has anyone here made an RPi car computer? [14:30] <lost_soul> watched a video of someone who did. I haven't been able to convince my son to take the plunge yet. [14:35] <Pkunk> Is there an issue with clock_gettime on 3.12.y kernels ? Its returning completely bogus values for me .. Or is it an issue with the B+ boards ? [14:35] <gordonDrogon> Pkunk, shoud have nothing to do with board rev. do you have a test program? [14:37] <gordonDrogon> Hm. hang on I'll run a test.. I always use gettimeofday though. [14:41] <gordonDrogon> Hm. I don't appear to have clock_gettime in my standard C library. [14:43] <gordonDrogon> what value of clk_id are you using? [14:44] <gordonDrogon> there is a sleep(1) in-between those. [14:49] <niston> Tinkerton: perhaps you can interface with the CAN bus of the car to read out the speed? [14:54] <niston> then use GPS for speed. but no rpm and other fancy for you, then. [14:55] <gordonDrogon> 6502 based with LCD display. [14:56] <gordonDrogon> It sensed road speed with a pulse sensor driven off the spedometer cable. [14:57] <niston> that a rockwell clone? [14:58] <gordonDrogon> there was a 2nd board with the IO stuff on it - opto isolators, relays, etc. [15:04] <gordonDrogon> Pkunk, gcc 4.6.3 on my Pi's. [15:04] <skyroveRR> Which distro do you guys use on your pi? [15:05] <IT_Sean> I generally use Raspbian. But... it depends on what you want to do with it. What are you looking to do? [15:06] <skyroveRR> IT_Sean: general usage, and some compilation. [15:06] <skyroveRR> On the pi itself. [15:06] <skyroveRR> Not heavy compilation... a couple of small C programs, nothing more than that. [15:07] <skyroveRR> I actually use a stripped down version of raspbian which a guy was kind enough to post on his web page. [15:08] <shiftplusone> which version is that? [15:12] <skyroveRR> Oh, unattended net installer... I don't really have bandwidth suitable for such installs.. I almost always go for offline installs. [17:00] <psyclepath> Hi. I want to run my raspberry pi version B as a mail server. Any suggestions on a good tutorial site ? [17:13] <gordonDrogon> psyclepath, Raspbian is more or less Debian, so google debian mail server and you'll find what you need. [17:19] <shiftplusone> or you could even find out which mail server is popular and look up the documentation for the specific software. [17:20] <IT_Sean> Most ISPs have the necessary ports blocked on home accounts. [17:35] <erebus^> shouldn't I be able to access my Pi via SSH from the first boot? [17:37] <erebus^> But I still get "ssh: connect to host 192.168.0.144 port 22: Connection timed out"
[17:38] <nid0> presumably you are connecting from a local computer in 192.168.0.*? [17:38] <nid0> does the pi respond to ping on 192.168.0.144? [17:40] <nid0> how do you know the pi's on 192.168.0.144 exactly, have you statically assigned that in the pi's config, or is it showing as a dhcp lease? [17:42] <nid0> can you ssh to it from the phone? [18:00] <Farioko> Looks like even if you do a proper graceful shutdown on your raspberry pi, even then, the filesystem can corrupt. Damn bought a €90,00 UPS and thought this should be over. [18:01] <gordonDrogon> Farioko, that sort of thing hasn't happened for about 2 years now. [18:01] <gordonDrogon> have you updated/upgraded the bootlaoder/kernel, etc. recently? [18:01] <Farioko> Few months a go. [18:02] <gordonDrogon> and despite the UPS, do you have a good quality PSU? [18:02] <gordonDrogon> so you should be ticking all the boxes - what exactly do you see happening? just an fsck, or files being moved to lost+found ? [18:03] <Farioko> by now all this money I could have got a nice x86 PC instead, with a trusty filesystem, UFS. [18:03] <gordonDrogon> if you want UFS then you can run freeBSD on the Pi. [18:04] <gordonDrogon> are you sure that's a file system issue? [18:05] <Farioko> gordonDrogon: Could be the SD Card too, haven't had luck with Kingston ever, their SSDs are unstable as hell, usb thumb drives seem crap too, and apparently their SD cards are also crap. Only the RAM they make is ok.
[18:06] <gordonDrogon> you're not alone in that observation. [18:06] <gordonDrogon> although I have 2 Kingstons from early on that are still OK. My others are Sandisk and the ones the foundation sells. [18:09] <gordonDrogon> winlu, try to keep it family friendly please. [18:11] <gordonDrogon> Farioko, have to say; I dumped *bsd 20 years ago and haven't missed it. [18:12] <gordonDrogon> it didn't serve my needs. [18:12] <gordonDrogon> I'm not sad at all. [18:13] <gordonDrogon> have to say though I might look at it again. two relatively recent event are make me reconsider. [18:17] <gordonDrogon> Farioko, systemd is one of the reasons. [18:19] <gordonDrogon> however the other things you list are neither here nor there for me. I use Linux routers at Gb speeds - the network stack there is more than adequate, as is ext4 for now, and I care zero for the argument that Linux is not Unix. Get over it, etc. [18:22] <Farioko> gordonDrogon: yea that's a long time, wasn't even on planet earth then. I feel the other way around, it can't beat desktop Linux, but as a server it's superior. [18:23] <gordonDrogon> I have 20 Linux servers in a data centre that pay for themselves that says otherwise. [18:25] <gordonDrogon> systemd is broken IMO. As is the other reason - the attitused of the Debian people towards the Pi. [18:25] <gordonDrogon> I have considered slackware. [18:29] <gordonDrogon> an issue for me is to stick to Raspbian because that's currently the 99% solution on the Pi. However all my other PCs, etc. run Debian, so from that point of view it makes sense. [18:29] <gordonDrogon> I'm fairly sure the foundation will stick to Raspbian even when it moves to Jessie & systemd. [18:31] <gordonDrogon> I don't think so. [18:31] <gordonDrogon> big userland tools now require systemd - at least on the x86 Debian - e.g. gnome3. [18:32] <gordonDrogon> if I had time I would produce a complete distro using the debian package manager, but not based on debian/systemd. [18:32] <gordonDrogon> I use file-rc on my virtual servers and embedded systems. [18:37] <gordonDrogon> oddly enough, I read that earlier. weird. [18:38] <gordonDrogon> I did try gnome3 under Wheezy. didn't like it. moved back to xfve4. [18:38] <gordonDrogon> I run that on my Pi's too. [18:39] <gordonDrogon> however my wife wants a bit more eye-candy - the only reason I looked at G3 in the first place. [18:55] <gordonDrogon> I've had a unixy desktop for the past 25 years. [18:58] <pepijndevos> I should really try riscos at some point. I wonder if it's useful or just nostalgic. [19:00] <pepijndevos> Does it have libc? [19:00] <gordonDrogon> I used it way back. like 20 years ago. [19:00] <gordonDrogon> I think there's a port of gcc to it now. [19:00] <gordonDrogon> how much libc it has is anyones guess. [19:00] <gordonDrogon> I abandoned it. Linux just left it behind. [19:04] <gordonDrogon> I've been looking at putting coroutines into my basic interpreter too. [19:06] <gordonDrogon> I do lots of stuff on ATmegas using coroutines. [19:07] <shiftplusone> gordonDrogon, care to weight in as a hardware developer? Pull downs on by default, yay or nay? [19:07] <pepijndevos> Nice. Hand coded C, or something else? [19:08] <gordonDrogon> shiftplusone, let the way the user last set them. [19:08] <gordonDrogon> shiftplusone, however the bcm manual lists the default power-on states. [19:09] <gordonDrogon> so leave them at the defaults then when the Pi powers up, peripherals ought to be wired to pins in the appropriate state. [19:10] <shiftplusone> From what I can see the arm peripherals manual simply says the pins are inputs, no? [19:10] <gordonDrogon> unless you install a dt-blog.bin of-course. [19:10] <gordonDrogon> no - the manual states the pull up/down states at power-on time. [19:11] <gordonDrogon> the 2nd column. [19:14] <gordonDrogon> actually, the manual says they are preserved over a power cycle. [19:14] <gordonDrogon> I thought I'd read that they were too. [19:16] <gordonDrogon> pepijndevos, my coroutines on the ATmega? I have my own task scheduller thingy for it. [19:20] <gordonDrogon> hm. let me test it. [19:23] <gordonDrogon> it's not halt time, it's power-on/boot time. [19:25] <gordonDrogon> its boot-code on the SD card. 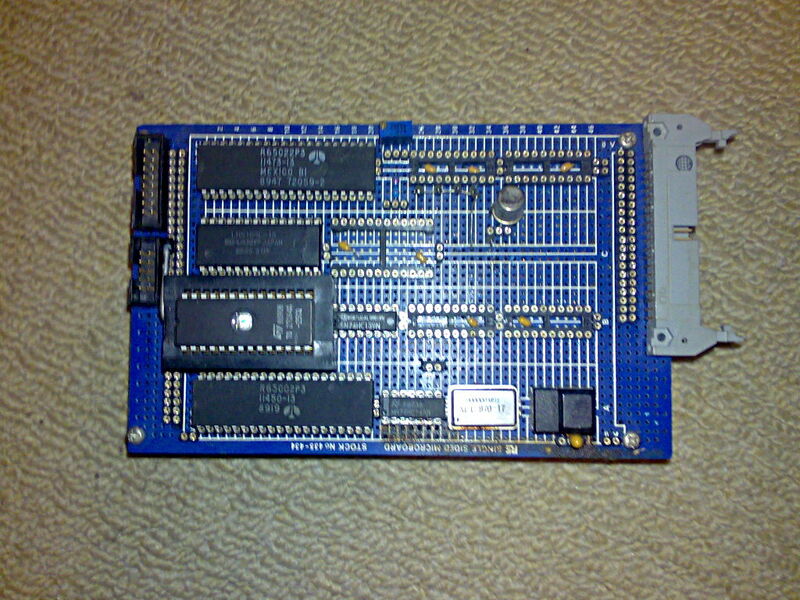 without the SD card plugged in, the pins go to their previous pull up/down state. [19:46] <niston> gordonDrogon: whats your basic interpreter? [19:46] <niston> got a page for it or something? [20:10] <krabban> I tried the Generic 105 (Intl) keyboard model but it doesn't map the keys right. [20:13] <shiftplusone> Could've got a nice bag of pis and a free meal instead. [20:13] <gordonDrogon> shiftplusone, yup - but then again, what a great opportunity for the doc who did the op! [20:15] <shiftplusone> Though to weigh in on the BASIC thing... it just seems ugly compared to C.
[20:15] <shiftplusone> bah... repeat until try$ <> "y"
[20:15] <gordonDrogon> you're looking at the symbols not the concept. [20:16] <gordonDrogon> I can replace <> with != or # - they're just symbols. [20:16] <niston> gordonDrogon: yeah I remember that all too well from my VB6 days. [20:16] <niston> especially linux people would make derrogatory comment about visual basic. [20:16] <shiftplusone> When I have a kid, I'll make sure they're raised in a proper C household. [20:17] <gordonDrogon> just remember that there are more basic programs and programmers than python programs and programmers out there today. [20:17] <shiftplusone> is that counting visual basic? [20:17] <shiftplusone> and if you don't count it? [20:18] <gordonDrogon> they're still vaid programming languages although I'm not a fan of them myself. [20:18] <shiftplusone> vb is a bit of a different beast to what most people would consider basic. [20:19] <gordonDrogon> what I found intersting doing some research was the basic was evolving nicely then the 8-bit micros sort of took over and due to their limitations compared to the minis/mainframes the language changed a little - maybe not for the best. [20:19] <gordonDrogon> however it was a fantastic success in the late 70's/80's to get more people into programming. [20:20] <gordonDrogon> I started in 77/78. [20:20] <gordonDrogon> well I was 16 then. [20:20] <niston> I often wished to be older too, back then. [20:21] <Armand> gordonDrogon: How dare you start something around the time I was born! 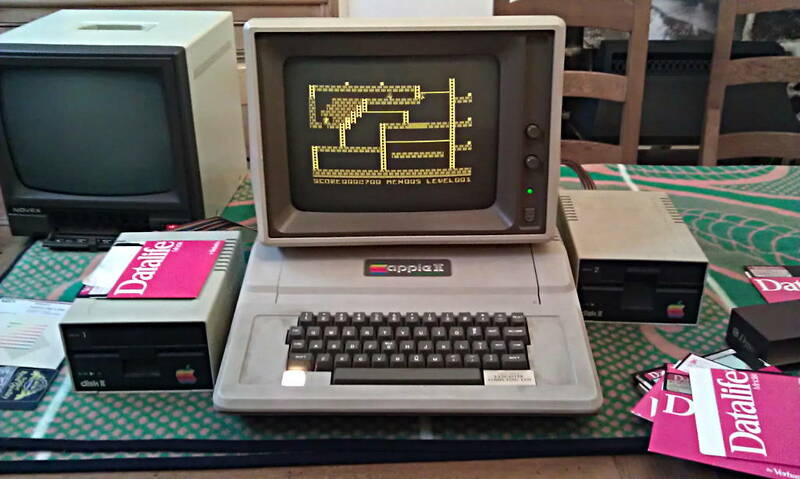 [20:21] <gordonDrogon> an Apple II - from 1978. [20:21] <Armand> I wouldn't know.. I'm 36 next month. [20:22] <gordonDrogon> just don't stop. that's my plan. [20:22] <gordonDrogon> keep the little grey cells active. [20:23] <gordonDrogon> niston, no ping? [20:23] <gordonDrogon> is it plugged in, etc. [20:25] <gordonDrogon> did you see that it's possible to do VGA directly off a B+ now? [20:25] <gordonDrogon> might have to wait until someone starts to make the PCBs. [20:26] <gordonDrogon> yes. it's 3 x 6-bit DACs implemented in resistors. [20:26] <gordonDrogon> back inna tick. [20:26] <niston> yeah and it doesnt use much CPU either, soo neat. [20:32] <niston> omg teh nsa stoel it! [21:03] <CoJaBo> Is there code for the pi to write to a serial-with-strobe-line? [21:04] <gordonDrogon> sounds like SPI. [21:07] <CoJaBo> gordonDrogon: SPI has a strobe line? [21:08] <gordonDrogon> it has a chip-enable sort of line and a clock line. [21:08] <gordonDrogon> so you start a transaction, the CE line goes low, the clock it toggled with each data bit sent out, then the CE line goes high again. [21:09] <lost_soul> does anyone else have an issue with a ssh error of something broken pipe when they leave a session idle for to long? [21:10] <gordonDrogon> lost_soul, going via a NAT gateway or direct? or wired or via Wi-Fi? [21:10] <gordonDrogon> CoJaBo, talking to a peripheral of some sort? [21:14] <gordonDrogon> CoJaBo, oh that - yes, use SPI. [21:15] <mikroskeem> hey is that true every rpi has eth0 mac address "b8:27:eb:6a:25:19" ? [21:15] <lost_soul> I will try to adjust the timing to 30 before I reboot next and see if that helps. I must say I doubt it though as, like I said, at times it works for a few hours before it borks on me. [21:15] <knob> lost_soul, sounds more like something on the network? [21:16] <Armand> niston: Only says "huh?" [21:16] <gordonDrogon> mikroskeem, the bottom 6 digits are the Pi's serial number - see it in /proc/cpuinfo too. [21:17] <gordonDrogon> CoJaBo, although driving SPI from a program is relatively easy in any language that can open files. [21:17] <CoJaBo> O it's just a device file..
[21:18] <gordonDrogon> CoJaBo, after the spi device driver has been loaded you have /dev/spidev0.0 and /dev/spidev0.1. Pi has 2 SPI CE lines. [21:18] <gordonDrogon> CoJaBo, look at wiringPiSPI.c if you want an example of how it's done - it's not difficult and I'm sure that would translate to other languages. [21:19] <CoJaBo> gordonDrogon: Is there a standard/common lib in Python? [21:19] <gordonDrogon> CoJaBo, Python? what's that? a snake on a Pi? [21:20] <gordonDrogon> Python is read-only. [21:23] <gune> Hey again guys. So i got a heatsink for the rpi(i know it might not be needed, but it was cheap so). Anyway, im getting 50-70C on the CPU during openElec navigation/playback, is this ok? [21:30] <NedScott> what skin are you using? [21:30] <NedScott> and is the RSS feed on? [21:39] <CoJaBo> The biggest advantage is the thing doesn't stick out 3 miles. heh. [21:39] <CoJaBo> I hate how far the A/V jack sticks out tho, ugh..
[21:46] <TheHacker66> add "Quartz SUCKZ"
[21:52] <mikroskeem> gordonDrogon: do you get i/o errors on pcf8574 with rpi? [22:09] <The_HunterT> Anyone know how to run two servos off one raspberry pi? [22:36] <niston> im not sure on how to handle pin directions..
[22:38] <niston> confusing. need a better system. [22:41] <mikroskeem> do i need to ground address pins? [22:44] <gordonDrogon> mikroskeem, you need ground plus the 2 I2C pins to the device. [22:44] <gordonDrogon> power from the Pi or external power. [22:45] <mikroskeem> sometimes chip works, but then it spits out those errors .-. [22:45] <gordonDrogon> what driver software are you using - wiringPi, or ? [22:46] <gordonDrogon> sysfs? for i2c ? [22:46] <gordonDrogon> how long are the wires? [22:47] <gordonDrogon> mikroskeem, er.. sorry. [22:48] <gordonDrogon> ah, the address select pins on the pcf8574 .. right. [22:51] <gordonDrogon> mikroskeem, ah, of-course - earlier today. yes, sorry. [22:51] <gordonDrogon> I run it at 400Khz for a lot of things, but the signal quality leaves a lot to be desired on a scope. [22:52] <mikroskeem> normal speed is 100khz? [22:53] <gordonDrogon> it's part of wiringPi. [22:54] <gordonDrogon> I've tried at 1Mhz and beyond ... unusable, but I did get the PiGlow to work at 800Khz. 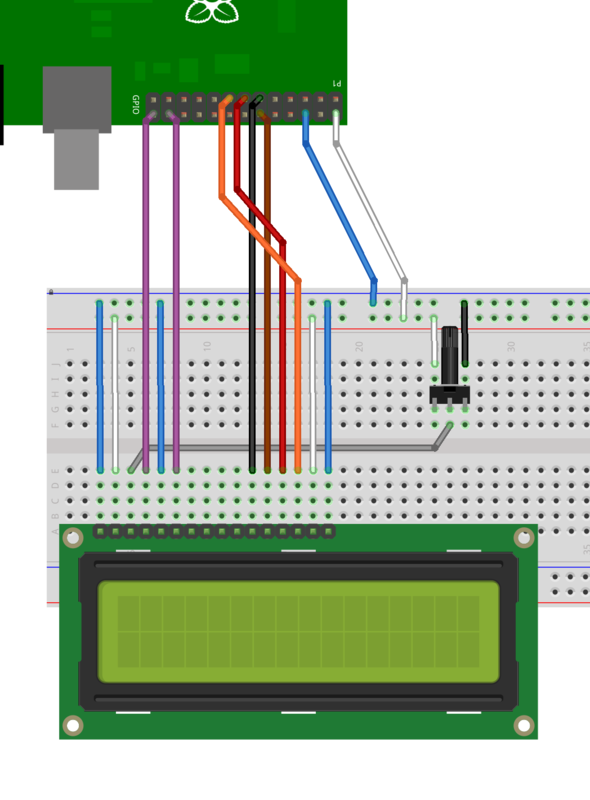 [22:55] <mikroskeem> also has anyone tried i2c gpio bitbang module? [23:01] <gordonDrogon> mikroskeem, I've not done it on a Pi. [23:15] <gordonDrogon> they're cheap & simple for an 8-bit port. [23:16] <gordonDrogon> actually, read he data sheet - they're very weird when it comes to input mode! [23:17] <gordonDrogon> they are failry weakly driven high - if you want to drive LEDs with them, then get them to sink the current - ie. set output to 0 to make LED light up. [23:18] <CoJaBo> gordonDrogon: I saw something that went into a LOT more detail even than that lol..
[23:28] <willmore> Anyone know if there is any hardware crypto in the rPi? I'm looking at speed comparisons between the rPi and the Intel Quark processor on the arduino board. The speed increase in AES is way higher than in any of the other crypto functions in openssl that I see. [23:29] <willmore> Maybe the ARM code for AES is just really good. The rPi does better at smaller block sizes compared to the quark. up to 9x vs 6x at large blocks. [23:29] <willmore> Come to think of it, that doesn't sound like hardware acceleration at all. Generally those do horribly at small blocks because key setup is still done by the CPU. [23:31] <willmore> B940 is my laptop (2.0 GHz sandybridge era chip) quark is obvious and the next lines are an rPi B+ at various overclocks on raspbian. [23:38] <gordonDrogon> all I know is that scp is pretty slow. [23:41] <zylinx> has anyone found an efficient way to use the RPi as a host for network screen? [23:45] <niston> how does piwall do it? [23:45] <niston> or does that require the same file on each tile Pi ? [23:46] <niston> and is really just a player with fancy network sync and cropping ? [23:46] <willmore> Updated the sheet to have some better description of WTF it is. [23:46] <niston> willmore: ops per second? [23:47] <willmore> Regardless, higher is better. :) The stuff off to the side--which I didn't describe are relative values based on the quark. [23:48] <willmore> Hmm, anyone got data on the Yun? [23:49] <niston> SpeedEvil: so you could create a h.264 stream on say, a server machine with a frame grabber, and distribute it to the Pis, and have each videocore show a portion of that stream? [23:50] <niston> no I mean per your suggestion. [23:59] * SpeedEvil wants concrete.